This week I'll be spending a day with a reception class, helping them tell the story of Jack and the Beanstalk with sound effects. 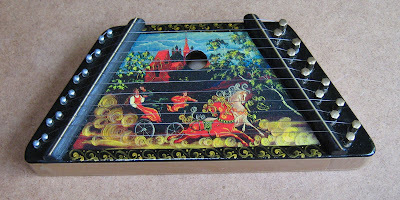 I have a beautifully illustrated and laquered dulcimer from St Petersburgh, pictured below, that will do nicely for the giant's harp. And the school has some drums that will be perfect for giant footsteps. There are many opportunities for sound in the tale and a good deal of magic. 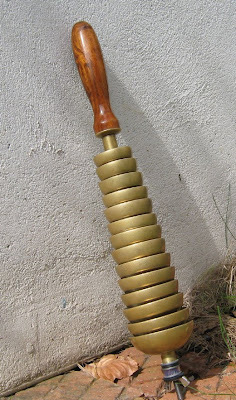 I thought a whole tone scale (eg C D E F# G# Bb C), or part of one, played on chime bars (one child per note) would be very magical and I may still go for that. But then I was teaching woodwind at a school this morning and saw a bell tree that hasn't moved since last September. I've loved bell trees since I first set eyes on one. They are satisfyingly solid and well-constructed and make a fabulous sound. They look like they haven't changed since some time in the 19th century, possibly earlier. I asked to borrow the bell tree and now have it for the week. It will provide all the magic Jack's handful of beans could require. If you have one of these, or add one to your collection, don't be tempted to undo the wing nut on the end. 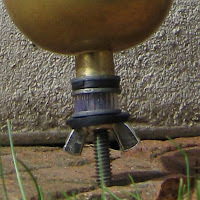 You'll have a devil of a job putting it back together again; there is a plastic sleeve that decouples the brass bells from the central stalk and the end is prone to flaring. My advice is to leave well alone. And Health & Safety (sorry): these are heavy. If one lands on a child's foot that child is going to know about it. The next day I'm doing We're Going On A Lion Hunt with another reception class. Fortunately I won't need the bell tree for that. My partner is using our car and the school is far enough on a bicycle without lugging around all that brass in my rucksack. I have been involved in a couple of projects recently where the ability of children to listen has been an issue of growing concern within the school, not just with respect to music but right across the board. 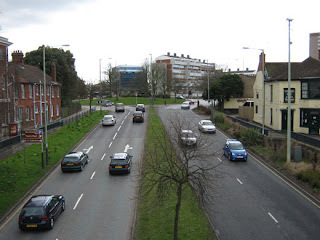 Both the schools are located in suburban areas where traffic noise is a constant. And there is anecdotal evidence that, for many pupils, little conversation takes place within the home but that they are filled with the noise of competing music, television and computer games. The verbal interaction is sparse and perfunctory. I don't find this difficult to believe. My own children will happily spend hours at a stretch at the computer if allowed. Recently I have been looking for a new house. When traffic noise is clearly audible the vendor always assures me that 'I really don't hear it anymore'. Are they telling me the truth? Well, sadly, yes they probably are. I've grumbled about my neighbour's fountain before. What I don't like about it is that I can no longer tell, just by listening, whether it's raining or not, whether it's windy outside or whether the birds have woken up. It blocks out these sounds and if I block out his fountain I block out all the other sounds with it. If you live in an environment where you have to block out traffic or the sounds of TVs, computers and stereos you're blocking out so much else as well. You must lose, through lack of use, the ability to distinguish sounds from noise. Is it then a surprise if you have problems listening? 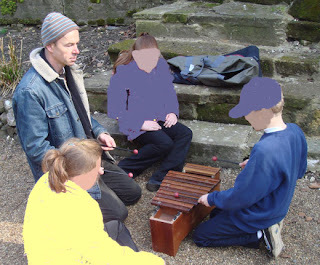 Last week, with other artists and teaching staff, I took a group of nine and ten year olds to Norwich's Plantation Garden, a former quarry transformed by a Victorian gentleman. We were exploring, very loosely, the concept of sacred space and contrasting the Garden with the Roman Catholic Cathedral in the adjacent plot. The former represents one man's vision while the latter is more corporate in its design and execution. We had a great time in the Garden, playing with mirrors, pinhole cameras and magnifying glasses. (This was about seeing the extraordinary in the ordinary.) There is a gothic fountain with frogs and fish and we took samples to view through microscopes. So what was a musician doing there? Well, partly it was about cross-disciplinary exchange and I very much enjoyed that. But my own contribution, besides a magnifying glass grabbed as an afterthought as I left home, was an old wooden xylophone. I brought two pairs of beaters and just the notes C D E F# & A as well as the same notes an octave higher. I could have chosen any other pentatonic scale: the beauty of pentatonic scales is that there are no 'wrong' notes and it is easier to generate sonorous harmonies. When the time feels right I sit in the sun playing the instrument until it catches a child's attention. I then teach them to play a simple game based on West African balafon technique which needs two people. By now someone else wants a go so I relinquish my beaters and help them get started. From here on in it's just a matter of making sure everyone gets a turn. Occasionally I remind them of the game but they are often happy just enjoying the sound, making up their own games or playing random notes in time with each other. The sound drifts around the garden. I have yet to play here officially but my friend Andy Kirkham, whom I play with in Eastern Straynotes, has played in the Plantation Garden for weddings. I look forward to my own turn. Oh, and the balafon game will be Game of the Month at www.playwithsound.com in April. I'll describe it and suggest some possible applications. 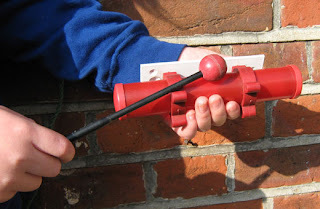 When you were young did you ever ring doorbells just for a laugh? I confess I didn't. I was almost certainly too scared but, in my defence, I must point out that front paths are much longer in the suburbs where I lived than they are in town and city centres where terraced streets are the norm. If you did, did all the bells sound the same? Doorbells have certainly gone through changes in style over the years from manually pulled or cranked to electronic novelty ringtones. My own front door has a knocker instead of a bell. 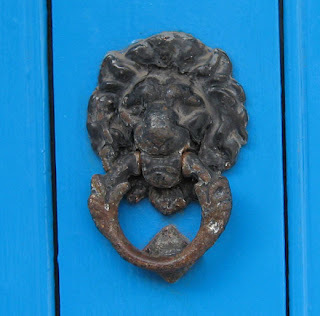 Both door and knocker are identical to those belonging to the flat upstairs. The doors are right next to each other and, even after ten years, I am occasionally confused. 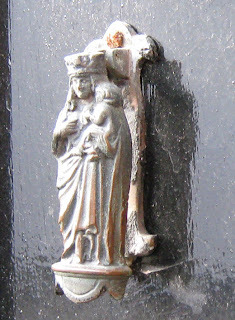 Today I saw a beautiful old knocker, featuring a Madonna and child (presumably), on a door to a tiny cottage which now forms part of the Maddermarket Theatre in Norwich. I found myself wondering if the tykes of yesteryear took any pleasure in the range of sounds produced by their mischief as they ran from door to door. The lack of either standardisation or mass-production must have made for a greater number of variables – type and thickness of wood, weight and material of the knocker, size of door, dimensions of chamber within etc. I would even venture that the variety was broader in its extent than any number of digitally stored chimes. I mean we're hardly talking high fidelity sound reproduction unless you are a real enthusiast (and I've yet to meet one). 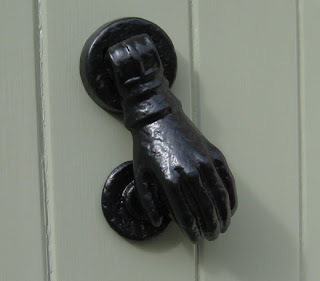 So if anyone fancies sponsoring the sampling, photographing and cataloguing of the world's door knockers I would be very interested to know. I think it would generate all sorts of fascinating insights and social commentary. Does anyone else share this interest? Does this qualify as disappearing sound or will door knockers stage a come-back? Do you have a sound interest of your own? This exercise is especially well suited to children aged between five and eight years and can be played with a large class. Ideally you will need plenty of instruments but there are perfectly good work-arounds that I'll detail at the end. I have found chime bars (I'm a bit of a fan of chime bars) to be useful in this context. I'll assume you have one for every child in the class but bear with me if you haven't; as I said, there are plenty of alternatives. Arrange your group in a circle that includes you and any adult helpers you may have. It is important that your circle is 'true'. Everyone in it needs to be able to see everyone else. And they all need sufficient elbow room to play their instruments. If you like, play a round or two of Quick Tick Tock. This will make sure everyone is as attentive and engaged as they are able. Split the group down the middle, one side of the circle being 'ticks' and the other side 'tocks'. Don't include yourself if you are the only adult present. If you have a helper then include yourself in one group and the helper in the other. Explain which side is 'tick' and which 'tock', count 'One, Two Three and' (or One, Two, Three, Four) to begin. It may take a couple of starts to get this right but one side should tick and then be silent while the other side tocks. Almost certainly some children will be ticking and tocking. This may be because they are looking across the circle at the other group. Ask all the 'ticks' to put raise their hands so they can see each other. Suggest they look at the others in their group while playing the game. Do the same with the 'tocks'. 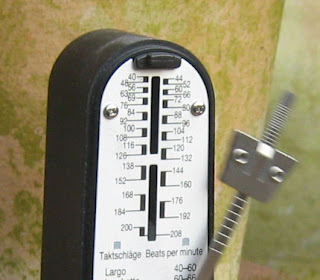 When you feel the clock is running as smoothly as can be expected, hand out the chime bars. To avoid unwanted noise, place the bars on the floor 2ft (60cm) in front of each child with instructions not to pick them up or try to play them with their feet. If you are really well supplied you can give bars you can give the 'ticks' the notes of one chord and the 'tocks' the notes of another but this will need some forethought if you are not to lose the attention of the class. 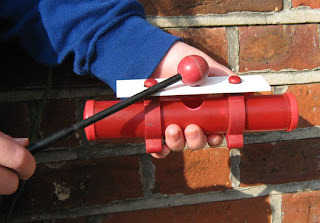 Demonstrate the wonders of the chime bar. How to hit it so it rings, how to dampen it and the sound it makes when you strike its sound box with the beater. Now stand in the middle of the circle and demonstrate your signal for stop and instruct the children to look out for it. 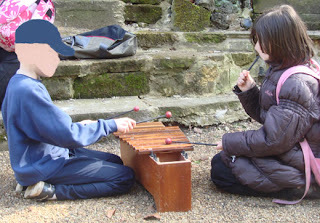 Ask them to pick up their chime bars and experiment. This will be noisy but hopefully enough of them will be notice when you signal an end that the rest will look up or be nudged by their neighbours. If need be tell everyone to put down their instruments while you speak. Now tell the 'ticks' you will want them to play their chime bars so they ring and tell the tocks you'll want them to hit the sound box with the beater. Set the 'game' in motion again and let people voice the ticks and tocks if that helps. Once this is running smoothly you are ready for the next stage. Demonstrate signals for loud (raised arms) and soft (arms down). Get everyone ticking and tocking loudly and quietly in response to your signal. Stop them tell the two groups to respond only to the arm nearest their side of the circle. Now demonstrate the art of making one side play soft, the other loud. Now swap them round. Both loud then both soft. And finally, ask for volunteers to conduct the 'clock'. I have seen children with various shades of SEN (special educational needs) positively beaming when given a chance to conduct. And after seeing this, 'dancing' orchestral conductors need no explanation. And the work-arounds? Basically, as long as the players on each side can make a sound similar to each other but different from the other group then that is good enough. Chime bars on one side, untuned percussion on the other, for example. If you can only improvise enough instruments for half the group, the other half can clap. 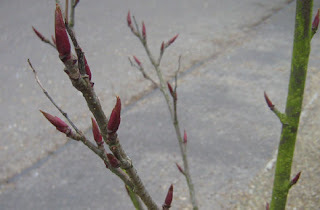 Spring is about here in Norfolk and the soundscape in which I live is about to change. Already my neighbour, who thoughtfully placed a water feature outside by bedroom window two years ago or more, has activated his fountain. Maybe it's a matter of taste, or perhaps I'm just a Philistine, but one man's bucolic fantasy is another man's plumbing nightmare. To be fair, it doesn't really bother me in the day but at night it's like staying in a cheap hotel and getting the room next to the toilet. And last weekend I heard my first electric lawnmower of the year. 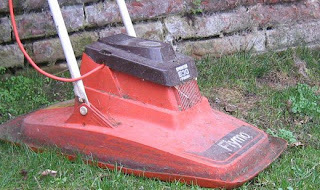 In case you have ever wondered, 'Flymo' has nothing to do with hovering, or flight of any kind, unless you include those nasty winged insects with the annoying buzz. Peaceful Sunday afternoons in the garden? Don't get your hopes up. Seriously though, and human noise aside, the sound of the wind is about to change here in England. It is made by the action of air on solid matter and for some months now this matter has mostly consisted of denuded trees and man-made structures. In a week or two, depending on the weather, millions of new leaves will be added to the mix. Softer, warmer, richer? Less lonesome? I'm not even going to try to describe it. Much better just to keep my ears attuned and enjoy the transition. This a good exercise for quickly assessing the ability and attention levels in a group. It can work for any age and is good for groups small and large, including classes of about thirty. 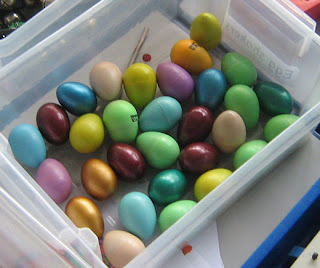 It can also be a starting point for a number of related exercises. For very young children it may help to take along a ticking clock as a prop in case the only ones they've come across are of the silent digital type. A pendulum clock would be wonderful but is obviously impractical. 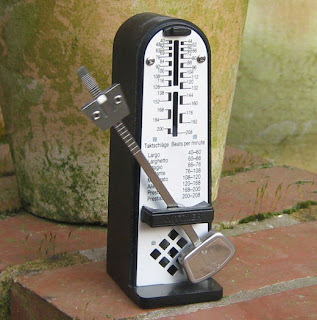 However, the pendulum image is very useful and I have portable clockwork metronome (pictured below) that I take along for this purpose. Its tick is suitably audible and regular. It's a great talking point but I stop short of passing it around. Before you begin, arrange your group in a circle so that everyone can see every one else. If this means moving chairs and tables then so be it. Explain to the group that you will imitate the ticking of the clock by taking it in turns to tick and tock around the circle. If you, yourself, are a 'tick' then Albert, immediately to your left, is a 'tock'. Beatrice, sitting next to Albert, will be a 'tick' and Cuthbert on her left, a 'tock'. 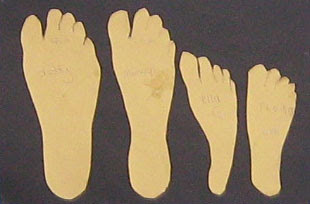 Continue demonstrating this by allocating ticks and tocks to Dorothy, Edmond, Felicity, Gawain and Henrietta. 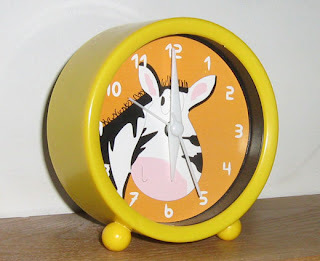 By now everyone should have got the idea and will probably carry on ticking and tocking around the circle when you stop. Stop them if they have carried on and check that everyone else understands what they are supposed to be doing. Now say you will count yourself in. Don’t explain why. Either count "One Two Three Four" or "One Two Three And". This is just an attempt to establish some kind of pulse and is very likely doomed to failure. Count yourself in and say 'tick' and look expectantly at Albert, helping him with his 'tock' if necessary. Follow the sound around the circle, giving eye contact to each child and continuing to mouth the words silently. Stop when it gets back to you. Don't be tempted to go round twice. If you didn't know already you have learned whether you have an odd or even number in the group. You also know if anyone needs further explanation of the exercise. Say how well it went but tell group you want to see if it can be as regular as the clock you showed them. By now everyone knows the rules of the game and the next attempt at tick-tocking around the circle will tell you something about the levels of attention and ability within the group. Remember that it is important that everyone can see everyone else. Otherwise children will find it hard to tell when their turn is coming and this will distort your findings. 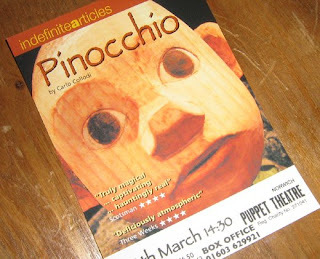 I've just visited one of my favourite venues, Norwich Puppet Theatre, to play for Indefinite Articles' Pinocchio. Steve Tiplady is a fine performer whom I've worked with many times. His shows always give the impression of barely managed chaos, Pinocchio being no exception, and this alarmed me at first. Now I realise that it's just his way and he can bring the audience back in the blink of an eye. For this show I play as the audience enters the auditorium and is seated. This can take ten minutes or so. I used to use soprano or alto saxophone for this but now I favour the clarinet. It can cut through a din if it needs to but can also play right on the edge of audibility. This is a great opportunity to play whatever I'm feeling; whatever the space suggests. For young children I usually start of in a major pentatonic - calm and unthreatening - but by the end I might be running through a klezmer tune or two. 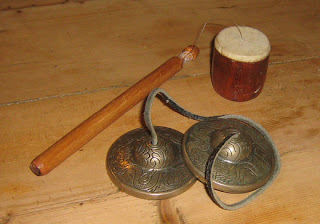 The show itself also features Tibetan temple bells and, for the first time today, a rather strange instrument that I used to use when touring with Baobab Theatre. Always a favourite with children it's very good for making the sound of frogs, crickets and squeaky doors. However, if you hold the stick and twirl the little drum (really just an amplifier) on the end of the length of fishing line it roars like a hurricane or strange beast. I wish I could remember its name. The wonderful thing about the Norwich Puppet Theatre is that it also acts as a puppet museum with puppets from the last thirty years of shows displayed and hung from every available piece of wall. A truly magical place to visit, although the thought of staying in there on my own for a night gives me the shivers. It is hired for seances from time to time, if that's the right word, and is popular with ghost hunters too. Some very brave souls work there. Over recent years there has been a shift towards including more and more children in mainstream schools who, in the past, would have been lumped together in 'special' schools. They include children with a range of disabilities, some physical, some mental and some with both. The accepted label for children who learn at a slower rate than average has changed over time. SEN, standing for special educational needs, is the term at the moment. The severity and complexity of special needs varies from child to child. Some have associated behavioural problems. For others their only issue is that English is not their first language and they have not yet had an opportunity to learn. I know too little even to formulate an opinion as to whether or not the inclusion of children with learning difficulties is generally a good thing in general. The fulfilling of the potential of the less able must be balanced against the needs of the more able. I have seen the latter looking frustrated and switching off and their boredom in itself foments poor behaviour. I can't help thinking the bright kids are getting a raw deal. The term 'special' is loaded. Aren't all children special and their needs equally worthy of meeting? Does anyone else feel the inclusion policies are driven by a mixture of economics and planning strategy masquerading as political correctness? I have led mixed ability sessions that all children a class of thirty appear to have enjoyed without bludgeoning them into compliance. (Only a cynic, and I am one, would venture that this may have been done for me before the event. )In each case there was good SEN support and the class culture was very orderly. I will give a more detailed account of the methods and activities I've used in a future post: activities that engage children who find participation in group work very difficult. 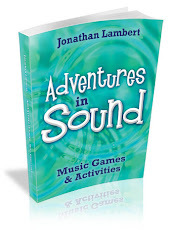 However, there are limitations to what can be achieved and getting a class involved in rhythm games of any kind is challenging, to say the least, if there are children who physically can't clap unless their support worker is moving their arms. Or who are so heavily medicated, or naturally away with the fairies, that by the time it is their turn to say their name, in a circle of others doing the same, they have completely forgotten what is going on. The great thing about rhythm work is the sense of achieving something as a team, with all the social benefits of boosted self-esteem and mutual respect that come with that. Dumbing down? There is a whole range of group activities that would be of enormous benefit to the majority of children but that they may well never experience. What on earth has this to do with music? Bear with me – I'm coming to that. But first I must tell you of my 'road to Damascus' change of heart. It came to me in a flash as I cycled past a typical example on my way to town and suddenly my heart softened. 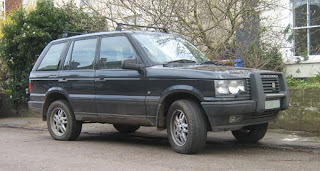 I now believe we should all learn to appreciate these monsters of the highway; not for the danger they present to other road users, nor for the emissions they generate and certainly not for the ease with which they plough up grass verges (perhaps in unconscious longing for their spiritual home). No, we should cherish them for the sound they make. Their particular vibration is unique to our age. Unlike that of the humble blackbird or the galloping horse it was unknown a century ago and, I confidently predict, will not be heard a hundred years hence. Only now, in the long history of the planet, can you hear this sound, live and for free, any day of the week on any street in the land. Get it while you can, even if you can't bring yourself to mourn its inevitable passing. I related my first impressions of the Easi-Speak back in mid-February. 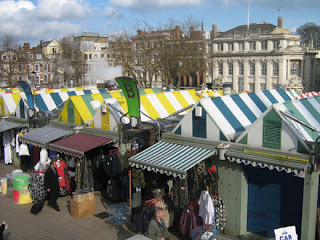 Well last week we took a bunch of year 3 children (aged 7 and 8) to Norwich market where, armed with the little USB recording microphones, they interviewed some of the stallholders. We had split into seven groups, each with a microphone. 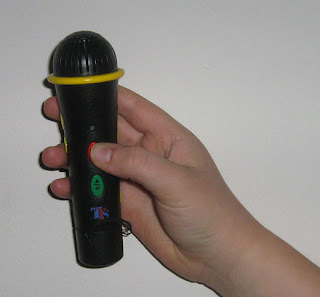 I know for a fact that in some groups the adult took charge of the microphone and in others the children took turns holding it. At the end of the day I took all the microphones home and downloaded the resulting files onto my computer. Of the seven groups, three had recorded WAV files and three had recorded mp3 files and one group hadn't recorded anything at all. One of the mp3 groups managed to record five files, one of which was eight seconds long, the others all four seconds or less and none of them containing anything of any worth. Another group presented me with 21 files, only eight of which was over ten seconds in length. One of those eight was eight minutes long. Another group gave me one file only that was nearly ten minutes long. Looking at the files themselves there was no appreciable difference in quality between the WAVs and the mp3s. No great surprise there: these were hardly laboratory conditions. As far as content was concerned this varied considerably. The children understood speaking into a microphone (although not the fact that putting it right up to your mouth will cause distortion). But they hadn't got the hang of pointing it at the interviewee when s/he is answering a question. Getting a usable result from this kind of file involves a large amount of time with a wave form editor to reduce the disparity between levels and remove sudden bangs and pops. What was very pleasing, though, was the way in which the microphones responded to being hand-held: there was no undue hand-generated noise. Perhaps what was most frustrating was the tendency for many budding sound recordists to press the record button repeatedly in an absent minded fashion, thus switching the recording on and off. This led to the many unusable fragments of just a few seconds in length alluded to above. 1. Give the children, and staff, adequate training in the use of the Easi-Speak itself. This should include switching on and off, recording and playback. It should also include switching between mp3 and WAV file formats. The display is limited to one LED and it is important to know what its various signals are trying to convey. Allow plenty of time for this familiarisation process. 2. Make sure the staff know how to charge the microphones and how to download and manage files. 4. Make sure the memory of the Easi-Speak has been wiped clean before embarking on your project, be it in school or in the field. The first thing I had to do on encountering the files at the end of the day was determine which were from the trip and which from previous use of the gadget. 5. Number each microphone prior to issue with masking tape. Alternatively hide a small slip of paper in the cap covering the USB plug at the base. That will allow you to address any shortcomings in technique with the relevant people after the session. 1. The Easi-Speak, at the very least, was a great confidence booster. It enabled kids with issues around vocabulary and self-expression to ask questions of complete strangers. 2. In spite of all I've said above we did come away with some usable (after a little work) material of great value. If I can square it with the school I'll try and post some of it in the future. 3. When I take out some nine and ten year olds from another school with Easi-Speaks next week I will know what I'm doing. 4. The response of the market traders to the children was a joy to witness. They were very generous of themselves and of their time. The kids even came away with sweets and bunches of flowers. A heart-warming day all round. 5. And finally, it really is a very handy piece of kit. 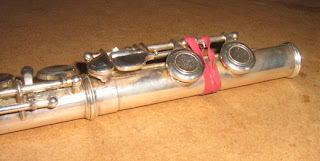 This afternoon, as I tried to get a student's flute to play for a little longer before an inevitable trip to the repair shop, she told me "I'll have to take it to the flutician".